What is bitcoin? Today two of my most advanced colleagues told me about the amazing bitcoin. I admit I do not know much about it and thus I googled for it. I found something interesting which I would like to share about Bitcoin. This is a currency which belongs to no country in the world and yet it’s goal is to become the currency of the world. Wait a minute, what is Bitcoin? How do you exchange for Bitcoins? What’s the value of Bitcoin versus your own currency? How much is RM1,000 in Bitcoin value? 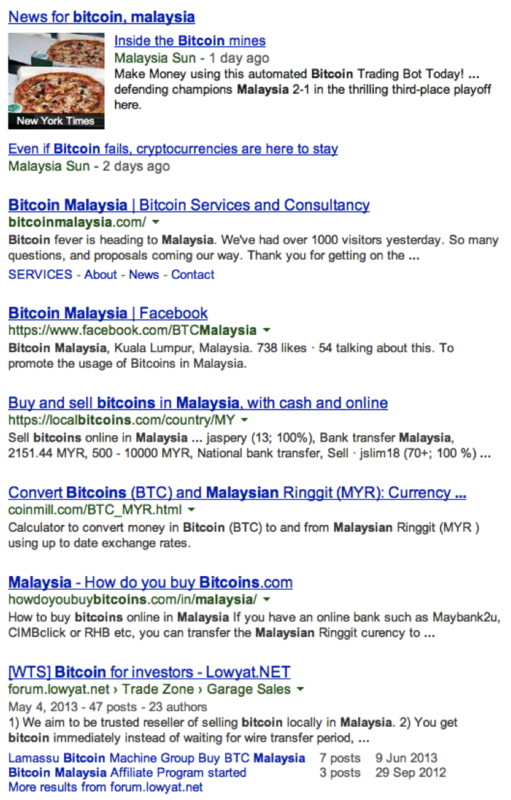 What about Bitcoin in Malaysia? A search in google revealed that it is indeed becoming very popular. Now, I answer my two friends. I do agree, Bitcoin is something which is becoming very big. In fact much bigger than what I have in mind as I read about Bitcoins many years ago. However, if you ask me if I would be investing / adopting Bitcoins, my answer remains a firm no. The reason is because there cannot be a currency for which exchange rate can continue to go up and people earns thousands from it. Some even earn enough profits from the exchange rate to buy an apartment! Today, I have read just 20 articles on Bitcoin. I did not choose to read pro or against bitcoin articles. I type ‘Bitcoin’ in google search bar and all the articles showed itself. I believe in working hard. I believe in creating value through better products. I do not believe value of any currency should be created out of nothing or without fundamantals. That is called speculation. One day, perhaps Mc Donalds may accept bitcoin as payment. Perhaps then, I may use it if I have no cash with me and I have just my smartphone. written on 23 dec 2013.